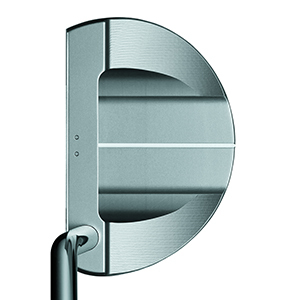 Twenty years ago Guerin Rife designed putters with closely spaced grooves running across the face allowing a putter to roll the ball smoothly upon impact; the design had the desired effect and many major golf manufacturers are now using variations of Guerin’s original groove technology. Closely spaced grooves create a superior roll and that softens the impact. In tests, a ball hit in the centre of a non-grooved putter travelled 25 feet. That same putter with grooves with just a quarter of the contact surface only reached 23.5 feet. On a 15-foot putt, a ball hit just half an inch off-centre will travel about 6” offline and 5% shorter. That slight miss-hit is a missed putt! 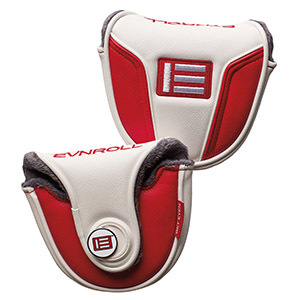 Evnroll® Precise face milling imparts progressively more energy transfer on off-centre hits to roll the ball a consistent distance with every stroke. 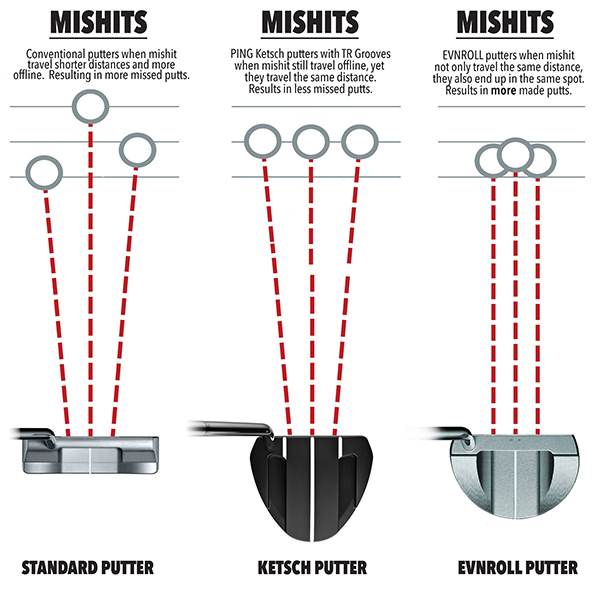 This milling pattern also moves the ball back to the centre, so you can roll your putts the same distance to the same spot you were aiming at even on miss hit putts. 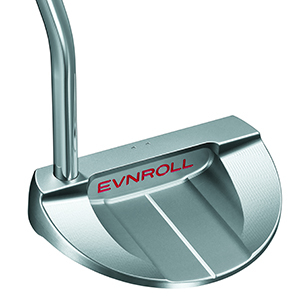 I have tested several Evnroll putters now and not once have I been disappointed they have all oozed perfection and the ER8 is no different, the mid-size tour mallet design imparts confidence in your putting stroke. From the way the club sits behind the ball to the way the shaft gently moves into your body putting you into the correct position with your head over the ball. The chunky slightly tacky putting grip is perfect and the two dots on the top edge with the white alignment aid on the base of the mallet at address help with your set up and ball placement behind the putter face. The feel as the ball comes off the clubface is perfect and with the technology embedded in the milling and face design, you know if you have read the line correctly the ball will run the distance you have calculated, even if you slightly miss-hit the putt. 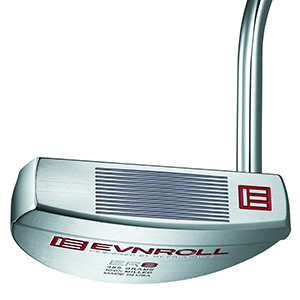 The only thing Evnroll putters can’t correct is a bad read or judge of distance, but you should make sure you get an Evnroll putter in your hands before your next purchase and if you like a mallet design the ER8 will be a potent weapon in your hands. I’ve just purchased the ER8 putter & do love the feel it has, tinkering about with different balls to see how they react. I am farsighted and wear contacts, but I’ve worked out that a green line as you’d use at the opticians, would be a better sight line than the white & the two dots would be better in red. So, I’ve got paint to try it out. I do believe that alignment line colours have an effect on putting, but almost NO utubers etc, post or have any thoughts on it. It must be that certain colours promote better putter focus. Be. It the alignment lines or the putters colour. To be honest Gary it’s something that I have never thought about but you are probably right. You have two options, you could contact Guerin Rife at Evnroll and tell him your thoughts or the more lucrative option would be to find out if your theory works and if so come up with something you could patent.